From the beginning, UC San Diego's Department of Music set a non-traditional course. LOCAL PHILANTHROPIST CONRAD PREBYS IS NOT A GOLFER. He doesn’t like to fish, he doesn’t want a boat and he has no interest in flying planes. Fortunately for the University of California, San Diego, he does like music. “It’s a true passion of mine and has been a great part of my life,” said the one-time aspiring musician.The San Diego builder demonstrated his love of music in May 2008 by making a $3 million gift to support the renowned UC San Diego Department of Music with the establishment of the Conrad Prebys Music Endowment. This gift comes just one year after Prebys made a $6 million donation, which enabled UC San Diego to continue building its state-of-the-art music center, now named the Conrad Prebys Music Center in his honor. The facility’s crown jewel—a world-class, 400-seat concert hall designed by Seattle-based LMN Architects in collaboration with Cyril M. Harris, Ph.D., one of the most respected acoustical engineers in the world—is named the Conrad Prebys Concert Hall in recognition of Prebys’s most recent gift. After years of planning, research and design, the state-of-the-art Music Center at UC San Diego is finally open, thanks to the generosity of Conrad Prebys, and the vision of Rand Steiger, chair of the university’s Department of Music. Founded by composers over 40 years ago, the UC San Diego Department of Music today spans a spectrum of music from classical to contemporary, including jazz, Hindustani, computer and experimental music. The faculty of the music department has included many distinguished composers, performers and scholars who have been recognized with Pulitzer Prizes, MacArthur “Genius” awards, Guggenheim Fellowships and Grawemeyer and Grammy awards. While most buildings begin from the ground up, UC San Diego’s construction of its new Conrad Prebys Music Center began from the inside out, with an emphasis on sound. Steiger, who is an internationally renowned composer and conductor with a long standing interest in contemporary music, played an integral role in developing the new facility and encouraging financial support. To Steiger and his fellow colleagues, the Conrad Prebys Music Center will be a new frontier in music. With this in mind, the best architectural and acoustical designers were sought to join the core design team––architects Mark Reddington and Wendy Pautz of LMN Architects in Seattle, and renowned acoustician Cyril M. Harris, whose career spans 60 years. Since 1979 LMN Architects has designed more than 45 cultural arts venues including 20 concert halls and theatres, such as Seattle’s acclaimed Benaroya Hall. Harris is a legend of both concert hall design and theories of acoustics and sound. Situated on the campus of UC San Diego at Russell Lane, the new Music Center will become a vital part of the campus Arts District, conforming to a “neighborhood plan” that unifies buildings through connections to public spaces and walkways, and architecture featuring appropriate proportions and design details. The concert hall’s interior is an asymmetrical system of triangular surfaces that fold around the room in different directions to diffuse sound evenly through the space. Built of cast-in-place concrete and aluminum/glass curtain wall, the Music Center also includes a small, flexible hall for multimedia and music theatre works, a 150-seat lecture/recital hall, and rehearsal rooms for chamber, choral, orchestral and percussion music. The building features the newest technologies in student recording suites, computer music labs, practice rooms, and offices. Many interior spaces have views of landscaped courtyards and outdoor areas. The Music Center will present a range of concerts from classical music to innovative new works incorporating cutting-edge technologies. It will also be an education center, as budding musicians from San Diego schools will visit to attend concerts, clinics, and classes. Learn how you can make a difference. For information about supporting the UC San Diego Conrad Prebys Music Center, please view our giving page. Founding Chairman Will Ogdon and the founding faculty built from the free-spirited educational environment encouraged by their former Hamline University mentor Ernest Krenek. In the beginning, classes, rehearsals, and concerts took place in buildings formerly occupied by the Camp Matthews military base. Muir College Provost John Stewart believed that "practicing the arts gave an insider's comprehension that was almost impossible to get through books and lectures." As UC San Diego began constructing its new music program, Stewart consulted modernist composer Ernst Krenek to help shape the department's mission. The emphasis was to be on composing and performing new and experimental music, as well as on developing innovative musical research and theory. In 1965, Krenek, then a former professor at Hamline University in Minneapolis, recommended his former student Will Ogdon (at left) as the department's founding chairman. Two more of Krenek's onetime students, composer Robert Erickson and conductor Tom Nee, soon joined Ogdon as UC San Diego's founding music faculty. "We wanted to make a rather different music department, one with a lot of daily contact between teachers and students, but without the usual packaging into degrees, units, grades and other trivia," Erickson recalled during an interview in the 1990s (he passed away in 1997). When classes began in the fall of 1967, quarters for the progressive new department were far from cutting-edge: instead, they consisted of a few vacated wood buildings and Quonset huts left behind by the U.S. Marines after the university acquired the 1,000-acre Camp Matthews for its new campus. Inside these World War II-era structures, isolated from East Coast, Midwestern, and European musical traditions, the department set up classrooms, offices, and, eventually, electronic music studios. This rustic setting, surrounded by acres of scrubby mesa land where live ordnance could still be found, would serve for several years, until Mandeville Center opened in 1975. 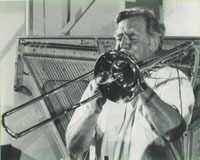 Trombonist John Silber's broad training at Southern Methodist University informed his approach at UC San Diego, where his undergraduate Music 1 course encompassed elements of music, dance, theatre, and visual arts. Collaboration between artists from different disciplines was then and continues to be part of the department's mission. When the Department of Music began in the late sixties, a single computer was so large that it filled an entire (air-conditioned) room. 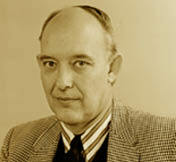 Roger Reynolds joined the faculty in 1969 and spearheaded the creation of the Center for Music Experiment. Faculty members Pauline Oliveros, Kenneth Gaburo, and James Campbell also introduced students to the CME and computer music. Their efforts were later augmented by those of Gerald Balzano and Richard Moore. Meanwhile, on the performance side, faculty members Bertram Turetzky (contrassbass), Jean-Charles Francois (percussion), Carol Plantamura (voice), Cecil Lytle (piano), Ed Harkins (trumpet), Philip Larson (voice), and Janos Negyesy (violin) pushed past traditional boundaries. Faculty ensembles like KIVA and SONOR were formed during the department's early years as vehicles for new and experimental music. The department moved from its old marine buildings to the new Mandeville Center in 1975. But the sound in the center's performance venues (including the 792-seat Mandeville Auditorium) was not well suited to music production and performance. The auditorium was designed as a general purpose facility to accommodate all manner of functions. After decades of considering a new building, the UC system finally approved financing for a new music center in late 2006 and construction teams broke ground in 2007. The new building opened in 2009 and was named for San Diego developer Conrad Prebys, who contributed $6 million as the building's naming donor and another $3 million as the naming donor for the building's superb 400-seat concert hall. With the new building and state-of-the-art performance spaces, the department dramatically increased its number of concerts during the opening season, 2010-2011. Two of the most popular series continue to be Camera Lucida (a chamber music ensemble established in collaboration with the San Diego Symphony) and Wednesdays@7, a showcase for innovative music by faculty composers and performers. Carrying forward the explorative tradition of the CME, the Department of Music offers a graduate degree in computer music research (as well as in composition, performance, and integrative studies). Many faculty and graduate composers collaborate with artists and techies at the Center for Research in Computing and the Arts (CRCA), which is housed within UC San Diego's California Institute for Telecommunications and Information Technologies (Calit2). Today, there is every indication that current faculty members David Borgo, Anthony Burr, Erik Carlson, Amy Cimini, Charles Curtis, Anthony Davis, Natacha Diels, Mark Dresser, Shlomo Dubnov, Tom Erbe, Nancy Guy, Sarah Hankins, Aleck Karis, Philip Larson, Lei Liang, Susan Narucki, Jann Pasler, Miller Puckette, Roger Reynolds, Stephanie Richards, Katharina Rosenberger, Steven Schick, Tamara Smyth, Rand Steiger, Wilfrido Terrazas, Chinary Ung and Shahrokh Yadegari will sustain the department‘s identity as a world leader in new and experimental music. UC San Diego’s music department was conceived during the 1960s. It was a time when political and social unrest swept across American college campuses and arts programs began to question and redefine their missions. Stewart, who served as both the Muir provost and a literature professor, had more than a passing interest in music. While at Denison University in Ohio, Stewart double majored in English and music. He played piano, bass, trumpet, and saxophone and performed the oboe with New England symphony orchestras. In 1966, the year before UC San Diego’s music department was scheduled to open, visiting Regents Lecturer and Professor of Music Rosalyn Tureck proposed opening a Bach institute on campus. Instead, Stewart kept the focus on avant garde music of the 20th century, and Tureck's Bach project never began. Stewart once said that his goal at UC San Diego was to create the West Coast equivalent of Darmstadt, the German experimental music center. The first step he took toward achieving this was hiring Austrian emigré composer Ernst Krenek as a consultant. Born in 1900, Krenek studied composition and counterpoint during his teens and 20s with composer Franz Schreker (1878-1934). Schreker had experimented with timbre and extended tonality while utilizing elements of Romanticism, Naturalism, Symbolism, and other turn-of-the-century styles. Meanwhile, Krenek studied music at the University of Vienna, the State Academy of Music in Vienna and the State Academy of Music in Berlin. He also had an internship as the director of the State Opera House in Kassel, Germany from 1925 to 1927. Krenek moved from Vienna to Berlin to Paris and back to Vienna during the 1920s, digesting the music of Bartok, Berg, Mahler, Schoenberg (specifically his 12-tone system), Stravinsky, Wagner, and Webern. Krenek was familiar with popular American composers such as George Gershwin and Irving Berlin, as well as with the American jazz performed by the Paul Whiteman Orchestra and others. Krenek’s use of American influences is often mentioned alongside that of Kurt Weill. For instance, Krenek’s 1927 opera Jonny spielt auf incorporated elements of African-American jazz in telling the story of an African-American musician, an unfamiliar subject for European audiences. Though Jonny spielt auf caused an outcry from Hitler’s followers and from staunch supporters of old-school classical music, it became a runaway hit and was performed on stages around the world. Krenek’s most famous opera, Karl V, was commissioned in 1930 by conductor Clemens Krauss for the Vienna State Opera. Krenek was inspired by the Roman emperor Charles V whose territory had included Austria. In the opera, Krenek defends Christian humanism against Hitler and Nazi nationalism. While composing the music, Krenek began using Schoenberg's 12-tone technique for the first time, a style he soon mastered and used until the end of his life. Meanwhile, the rise of Nazi influence meant that Krenek’s anti-nationalist, avant garde opera was unable to premiere in Vienna as planned. Instead, the premiere did not take place until 1938, when it debuted in Prague. At UC San Diego, Stewart followed Krenek’s recommendations and hired Ogdon (who, like Krenek, had used the 12-tone system), Erickson, and Nee, who became the artistic director of the La Jolla Civic Orchestra (now the La Jolla Symphony & Chorus). Ogdon composed his first piece in 1938, four years before arriving at Hamline to study with Krenek. By that time, Krenek was already writing 12-tone music, and Ogdon was quick to follow his lead. Ogdon’s Three Piano Pieces (1949) was chromatic and atonal, with echoes of Bartok and Schoenberg. A few years later, Ogdon composed Two Kechwa Songs (1955) for soprano June Jeffries Peterson, who performed the work in a series directed by Nee. As one of San Diego's most visible advocates for new music, Nee introduced programs that incorporated modern music alongside classical during his 31-year tenure directing the La Jolla Civic Orchestra, cultivating an audience for the new experimental music created and performed within UC San Diego’s unique department. “For me, Krenek was the perfect teacher,” Erickson said in the documentary Change: The Music of Ernst Krenek (1988, available at UC San Diego’s Arts Library). “He never gave tasks, he never controlled your style.” Krenek believed that the traditional composer’s education of imitating Beethoven and other masters restricted creativity. “We wanted to make a rather different music department, one with a lot of daily contact between teachers and students, but without the usual packaging into degrees, units, grades and other trivia," Erickson explained. "We wanted a place where making and performing music was a central activity, where research and theory could reflect 20th century concerns.” With this mission in mind, Ogdon and Erickson built a department that brought together experimental studies, composition, performance, technology, theoretical studies, literature, and special studies. The first class of 1967 included experimental music pioneers Jack Logan (trumpeter), Alan Strange (composer/visual artist and author of Electronic Music Systems and Techniques), Alan Johnson (clarinetist/conductor), and Bill Mullen (composer/violist). Also in the thick of things were John Glasier (microtonal musician and Harry Partch’s assistant), Rob Robboy (cellist), and Lester Wylie (cellist). In the late 1960s, a single computer was large enough to fill an entire room, magnetic tape was the predominant recording medium, and few could imagine the significant influence technology would soon have on performers and composers. Pauline Oliveros joined the music faculty in 1967. A composer and computer music pioneer, Oliveros had studied with Erickson at San Francisco State University and was an early member of the San Francisco Center for Tape Music. Along with Oliveros came recording engineer James Campbell from the University of Illinois. Campbell had worked with Oliveros at the Tape Music Center and became the department’s authority in technical matters. Oliveros and Campbell spearheaded the creation of one of the earliest electronic music studios on the West Coast at UC San Diego, equipped with a Buchla computer suited to music applications, Moog synthesizers and other new technologies. Borrowing the department’s portable tape recorders, students were sent to explore the campus and capture interesting sounds. Back at the department’s Quonset hut studio, they cut, spliced, and dubbed the sound samples to create new works. Other notable faculty hired during the 1960s included conductor Daniel Lewis; John Silber, an improvising trombonist and medievalist scholar who had studied with Ogdon and Erickson at Wesleyan University; contrabassist and improviser Bertram Turetzsky; violinist and conductor Rafael Druian, who later led the New York Philharmonic; and composer Kenneth Gaburo, whose Rockefeller Foundation grant enabled him to launch NMCE IV, a collaboration between an actor, a mime, a gymnast, and a sound-movement artist. Gaburo went on to produce several more interdiscplinary works. When renowned avant garde Italian composer, pianist, and critic Niccolo Castiglioni arrived as a visiting professor in 1968, his willingness to come to a new program in a sleepy corner of the United States offered evidence of the music department’s growing international reputation. 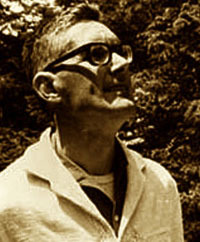 Castiglioni worked with the 12-tone system, was involved with Luciano Berio’s early work at RAI electronic music studio in Milan, and had taught summer courses at Darmstadt, Germany’s renowned experimental music center. Other visiting lecturers also made a mark. 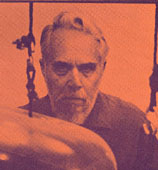 Instrument builder and composer Harry Partch came to UC San Diego after Ogdon offered space in a Quonset hut for the odd-looking instruments Partch built. Frustrated with conventional instruments and Western music’s chromatic scale, Partch developed his own 43-tone scale and instruments designed to accomodate it. However, Partch's first class at UC San Diego was a disaster. According to one student, the course comprised of a stream of consciousness rant in which Partch “denounced the department and the entire state of American music.” Partch left academia soon after, but he lived in the area for many years and his influence continued at UC San Diego. 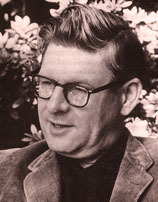 Composer Roger Reynolds joined the music faculty in 1969, four years after meeting Stewart on a trip along the West Coast and one year after visiting the campus as a Regents Lecturer. Reynolds attributed his decision to join the faculty to Ogdon’s vision for the department as a dynamic, interactive artistic community. A pianist who earned a BSE in Engineering Physics and an MM in Music Composition at the University of Michigan, Reynolds was an early advocate for computer music. Shortly after arriving at UC San Diego, Reynolds founded the Center for Music Experiment (CME) in 1971. CME evolved into what is now known as UC San Diego’s Center for Research in Computing and the Arts at Calit2. Reynolds served as Calit2’s first composer-in-residence from 2007 to 2010, further strengthening the connection between music and technology. Reynolds won a Pulitzer Prize in 1989 for his composition Whispers Out of Time, debuted his epic multimedia work Sanctuary in 2007, and continues to stay busy by creating new works that combine live performance with the latest technologies, including video, multi-channel audio, and computer processing. When the department first launched, graduate seminars were intense and personal. According to Reynolds, the seminars were “more like psychiatric encounter groups. The students were extremely radical and intellectually aggressive.” Performance of works by graduate and undergraduate composers was central to the Ogdon credo. Each quarter comprised of several concerts; today, the department supports more than 100 concerts during each academic year. The world-renowned IRCAM (Institut de Recherche et Coordination Acoustique/Musique) in Paris, created by Pierre Boulez and opened in 1977, used CME as its operational model by bringing together artists, scientists, mathematicians and engineers to develop and model new music. Since then, UC San Diego has continued to influence IRCAM (and vice versa), with students from both sides of the Atlantic commingling. The Department of Music solidified its international reputation by 1969, despite its continued operation within the old military buildings. Featuring world-class faculty, an innovative curriculum, computers and software entering exponential growth mode, and graduate performers and composers making important progress in the tech-savvy world of new music, the department was ideally positioned for the decades ahead.